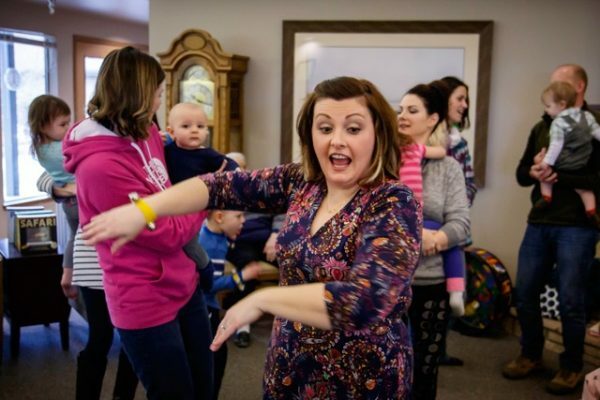 Inside a petite New Zealander is a whole lot of joy in music-making that she shares with other moms, their ukuleles, and the Oak Harbor community. Mary Clarity, here in Oak Harbor with her Navy husband and family for a while, is from Hawks Bay in New Zealand. Her accented voice adds to the natural appeal and energy that flows easily into her friendly chatter and can-do-ness. 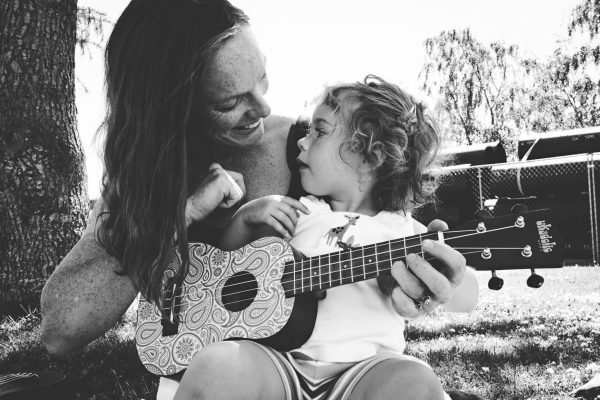 On Mondays, she and a group of “Ukuladies” gather to practice music, get their kids together, and drink coffee. We meet at Aisha Mayfield’s cozy home. Preschoolers run around playing with trucks. As we walk in, Mayfield announces that her mom’s scones are fresh from the oven and walks out of the kitchen with a plate of them. Buttery, flaky, warm. When Elizabeth Westfall walks in, Mayfield says, “You want your usual?” and Westfall does — a butter pecan iced coffee. “Aisha’s got an awesome coffee machine,” Clarity says. “This will change your life,” Westfall agrees, sipping her coffee. After coffee, scones, and greetings the ladies sit cross-legged on the floor, on couches, and chairs. They play “I’ll Fly Away,” and Mayfield’s dad Oliver joins in the singing while leaning against the kitchen doorway. Next, they sing Leonard Cohen’s “Hallelujah,” and the preschoolers who were playing come and sit with their moms. Mayfield sings high harmony while playing her ukulele, which is etched with spirals for the word peace in different languages. 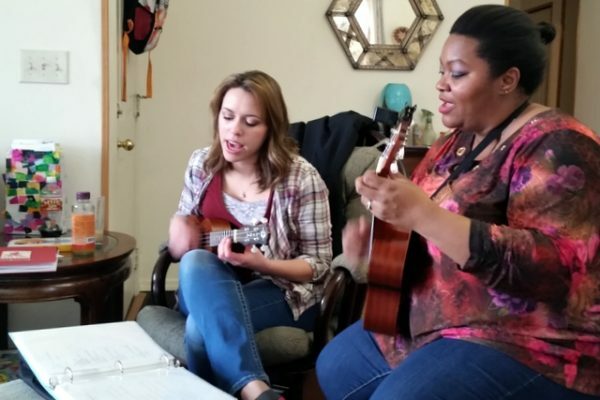 Playing ukulele together naturally creates friendships in this easy group and as a result, the ladies gather at Whidbey Island Coffee, the Roller Barn, and the Terrace Wine Bar and Bistro to play. “Every couple of months, we go to the wine bar and play and cackle and have the best interactions with the customers,” Clarity says. It’s called “Oak Harbor Love Song,” and is an ode to the whales, eagles, water, and friends having a good time, despite the fact that it takes a while to drive to Target and Costco. 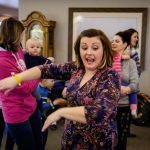 Along with having fun, Clarity says, the goal of the Ukuladies is to teach parents to make music with their kids. Gathered around the fireplace last Friday were a dozen or so senior citizens waiting for the music to begin. They were soon joined by parents who walked in with their preschool children. Collins hosted the morning, playing her ukulele and singing good morning to the families and the gathered residents. Indeed. 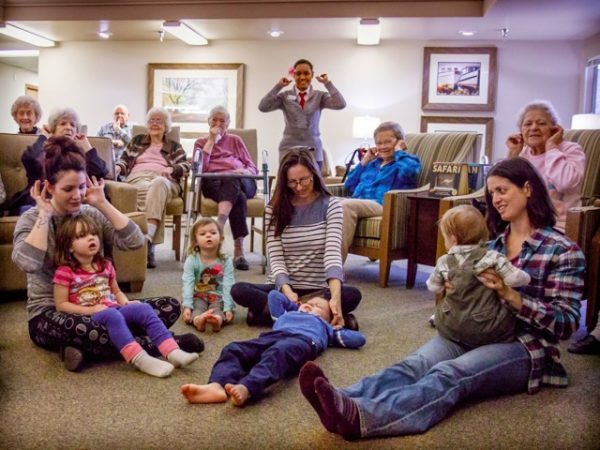 The singing and interaction with parents, toddlers and seniors was catching. After the bell song was over, Collins handed out colorful scarves and played a recording of “Twist and Shout.” Children and their parents danced with abandon and seniors raised their hands over their heads, grooving to the music. Everyone sang to resident Linda du Brae to celebrate her birthday. “I love this,” she said. 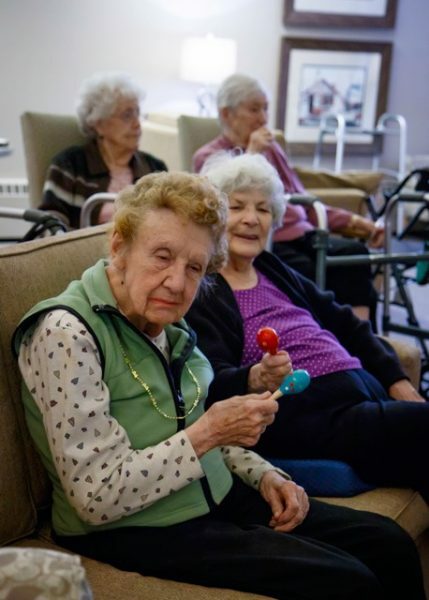 At the end of each song, Collins sang about putting the instruments back in their boxes and baskets and gathered maracas, tambourines, and egg shakers for “When the Saints Go Marching In.” All were caught up in singing and playing and two residents sitting together on the couch tapped their maracas together in time to the music. The 45 minutes passed quickly, and Collins ended the class by singing goodbye to everyone until the following week. A little boy named Oliver hugged her. Resident Victoria “Tori” Hayden said she liked the music so much that she had to play some for herself and walked to the piano where she sat down and played some old tunes from her time. “She reminds me of my grandma,” Collins said, watching Hayden play with abandon and certainty. Another resident, Janice McCaffery, said she enjoys the visits each week. “Life gets away from us if we don’t take time to enjoy it,” she added. 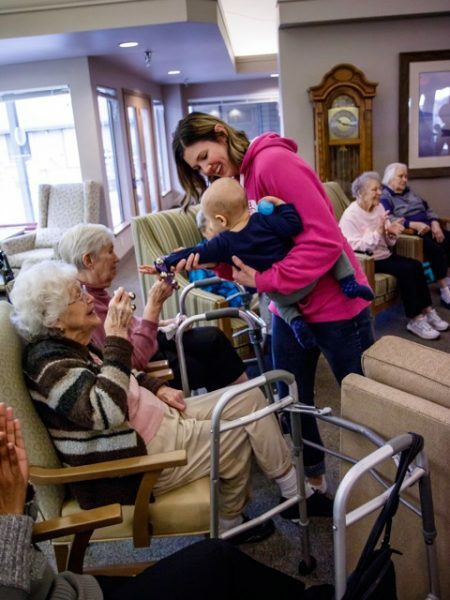 Afterward, Collins said she uses songs from the seniors’ generation, 1940s songs, and some rock and roll thrown in when playing at the retirement community in Oak Harbor and at other senior centers in Anacortes. Beautiful! Music shared is always good news. Thanks for this report, Kate!